Designed to advance the electrician in the Code from the Journeyman level to the Master's level! This book Master Electrician Exam Questions and Answers, will prepare you for both, the code book related questions and the new "no book" (formally titled closed book) questions. This book also includes the most popular electrical exam formats (number of questions, time allowed, etc.) and is the best way to study the Code book as it forces you to find the answers in the time limit. 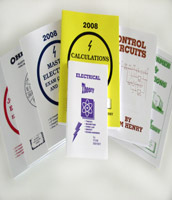 The 2008 Master Electrician Exam Questions and Answers workbook contains 12 closed-book exams, a 50 question true or false exam, 17 open-book exams, along with a 4 Hour 100 question Final Exam! Over 1,940 exam questions with answers, along with Code references. 327 pages total! You will also need to study other books on Calculations, Ohm's Law, Theory, Transformers, etc. in your proper preparation for the electrical examination.The Master Electrician Exam Questions and Answers book is also available in Master combo #1. Master Combo book packages help you get properly prepared for the licensing exam the first time and saves you money. Discount and savings vary. 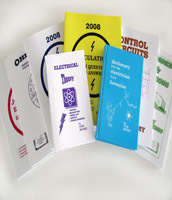 These book sets are designed for the electrician that would like to advance from the journeyman or similar license to the master level. Many of the books found in the journeyman packages are also found in the book sets listed below. 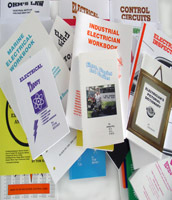 Master combo # 4 includes 30 of Tom Henry's electrical books and is the contractor's choice. 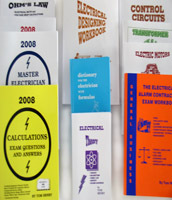 A popular 8 book set of Master exam study-aids. Save $53 over individual book prices. This combo includes all the books from Master Exam Combo # 1 plus the Dictionary for the Electrician With Formulas. Tom Henry's big 11 book set of study-aides for the electrical contractor which includes burglar and fire alarms. Includes Administrative Law questions and the Electric Motors Workbook. Save $70 on this combo. Includes 30 of Tom Henry's books. The Contractor's choice! Properly prepare for the electrical exam with this combo and save $226. Code Electrical Classes Inc. offers a 2 Day Saturday and Sunday Class to prepare the master electrician for the electrical examination. Classes are held from 8:00 am to 4:00 pm. View our current electrical seminar schedule. This course is designed to prepare the electrician for the Block & Associates, Thomson Prometric formerly Experior, P.S.I., National Assessment Institute, I.C.C. exams or any city, county, and state electrical exam.